This Cherry Cream Cheese Frosting recipe is silky smooth, extremely flavorful, and pipes beautifully! It has the perfect balance of cherry and cream cheese flavor and it can be whipped up in no time! I LOVE this frosting with chocolate cakes and cupcakes, although it also pairs nicely with yellow & white cakes too! In fact, it’s so good that you’ll want to skip the cake & just grab a spoon! 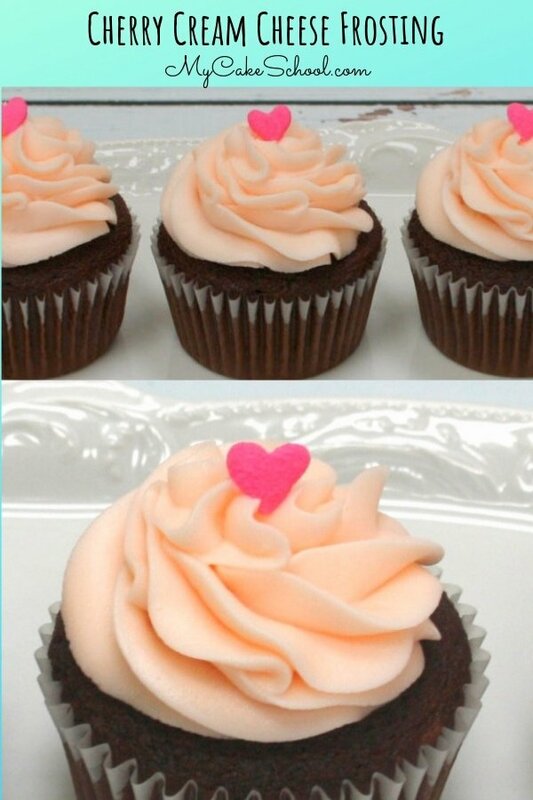 The cupcakes pictured above were made with our scratch Chocolate Cake Recipe & swirled with a 2D piping tip. 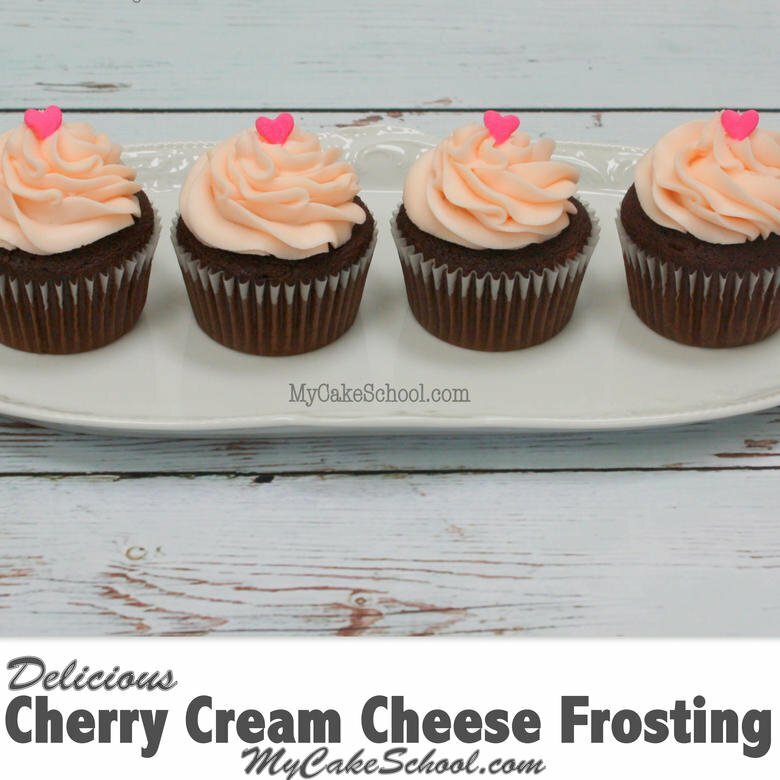 We often like to use this cherry cream cheese frosting as a cupcake filling. To do this, simply insert a frosting-filled piping bag fitted with a 10 or 12 piping tip vertically into your unfrosted cupcakes (about midway down) and fill with a bit of Cherry Cream Cheese Frosting, and finish with a swirl on top! When filling cupcakes, it’s good to do a practice run just on a plate first– simply pipe vertically onto the plate and count the seconds that it takes to get the amount of filling that you will want in your cupcakes. As with most cream cheese frosting recipes, this Cherry Cream Cheese Frosting is softer than usual buttercream frosting. If it becomes too soft, the frosting will not hold it’s shape nicely, and you won’t get the clean ridges and details from your piping tips that you should. If you notice that your cherry cream cheese frosting is too soft, you should chill it in the refrigerator for a few minutes until it firms up a bit. If the frosting just seems exceedingly soft, it’s perfectly acceptable to stir in a bit more powdered sugar, just as you would for most buttercream frosting recipes. This will help with the consistency. As funny as it sounds, some people just have hot hands! Holding a piping bag for an extended time can result in extra soft frosting for some decorators. A great solution is too prepare two piping bags and alternate between the two– you could rest one on a bag of ice on in the refrigerator while working with the other. Cream cheese frosting needs to be refrigerated. There are differing opinions on how long cream cheese frosting can safely sit at room temperature–but for me, a few hours seems to be a good rule of thumb. Because cream cheese frosting (just as with buttercream) becomes firm when chilled, it is best to remove from the refrigerator 2-3 hours before serving so that it has time to soften. 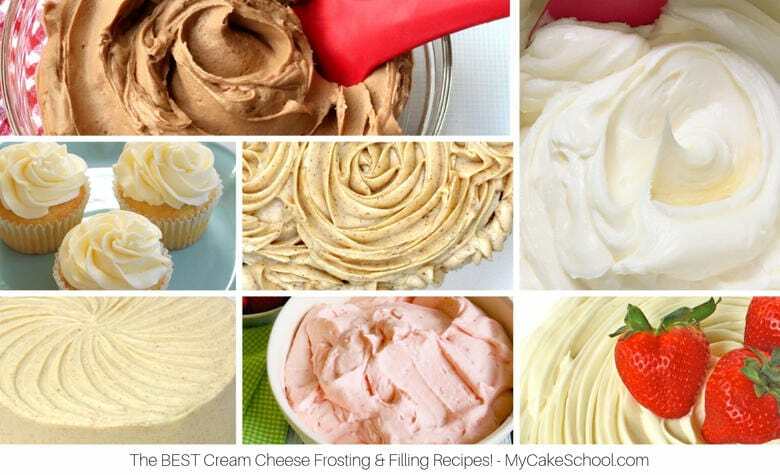 If you are a fan of all cream cheese frostings, we have a roundup that you are going to love! Here is a collection of our FAVORITE cream cheese frosting recipes– you’ll find a wonderful variety of flavor options, each one of them is so delicious (and simple to make)! Roundup of our BEST Cream Cheese Frosting Recipes! Save this Recipe for Later! You can Pin it Here! This Cherry Cream Cheese Frosting has the perfect balance of cream cheese and cherry flavor! So silky smooth and tastes fantastic with cherry cakes and chocolate cakes! 2( 8oz.) packages cream cheese (total weight 452g)- I used full fat cream cheese. Using reduced fat or the spreadable cream cheese will cause the frosting to be too soft. Do not soften the cream cheese. Wilton Rose Gel Color, optional - I used a very small amount, putting the color on a toothpick to add to the frosting. a towel to keep a cloud of powdered sugar from floating over your kitchen). Add the gel color at this point, increase mixing speed and beat until fluffy, approximately 1 minute, don't over beat. This frosting will pipe best when chilled. You can make it in advance, refrigerate and when ready to use, let it soften slightly (do not microwave) and remix. 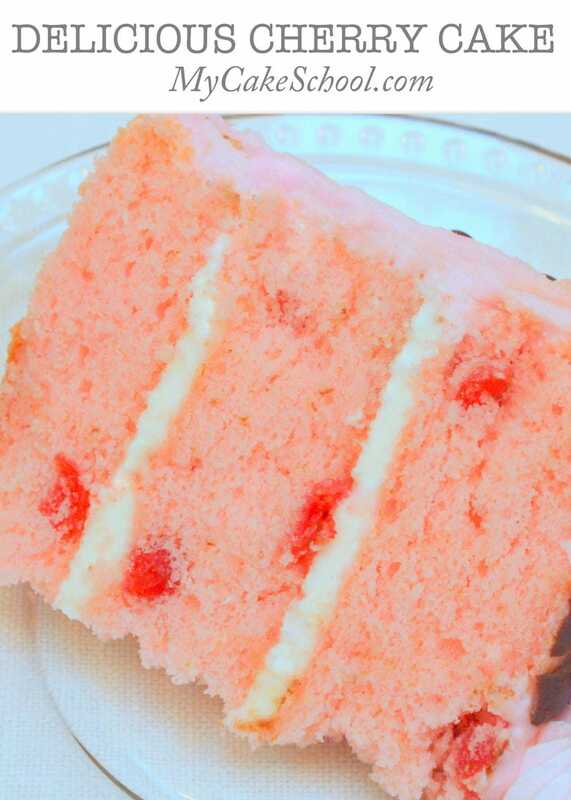 We also love this Cherry Cream Cheese Frosting with our homemade Cherry Cake as well as our Scratch Cherry Chocolate Chip Cake recipes! Hi ladies, could I use this same recipe with almond flavoring as opposed to cherry? Does this crust? Also I have a large batch of whipped non crusting almond buttercream frosting that I need to put on a large sheetcake. My question is: is it better for me to use this whipped frosting as the filling since I was thinking it may be too soft for a sheetcake? I will have extra left over and it is so darn good so what do u think about me mixing that non crusting with a crusting buttercream so will be able to make corners sharp and also get top of sheet smooth? I will be using plunger cutters to make butterflies and flowers all over the sheetcake, not covering with fondant. Please give me input on how to proceed…I found this whipped frosting on line and fell in love with how light it tastes, and I made alot of it. I just don’t want to dump it if possible. It is an all butter recipe. Even if I need to add a crusting bc to it, I just want to know if it will work and the ratios. I also didn’t know how non crusting would work with the cutouts. Any ideas on how to approach this project? The cake will be for 80 people. Due Saturday! Thanks so much!!! oooh this looks delicious! What brand of cherry flavoring did you use and where did you find it? I have a hard time finding different flavorings in my area. Hi Terri- This frosting has just the slightest crust after it has been out for a while. It wouldn’t be ideal for the Viva paper towel method…but it does pipe nicely and holds it’s shape. It’s best to work with it while slightly chilled. As for your whipped frosting question, you may have worked this out by now but I’m just not sure. I’ve combined frostings in the past (cream cheese frosting with vanilla buttercream for instance) but in your case, I’m not sure if the whipped frosting is too soft/airy to hold up to being combined with something else. I guess the only way to know for sure is to experiment with small amounts in a bowl first to make sure you like the consistency. As for the fondant accents, I would add those close to the time of the event and you should be fine! Sometimes fondant can absorb the moisture of the frosting and soften. I hope this helps!! Hi Dene, I used Watkins Cherry Extract. I found it at Wal-Mart, McCormick also has a cherry extract but was not available at my local grocery. Thanks Melissa and BeBe! I found the Watkins!!! HI Ejfan45, Cherry juice would not be as intense a flavor as cherry extract. You probably would get a stronger flavor using a teaspoon of the juice from a bottle of maraschino cherries, or cherry preserves or jam. Hi Cristiane, I think this recipe makes 4 cups frosting. 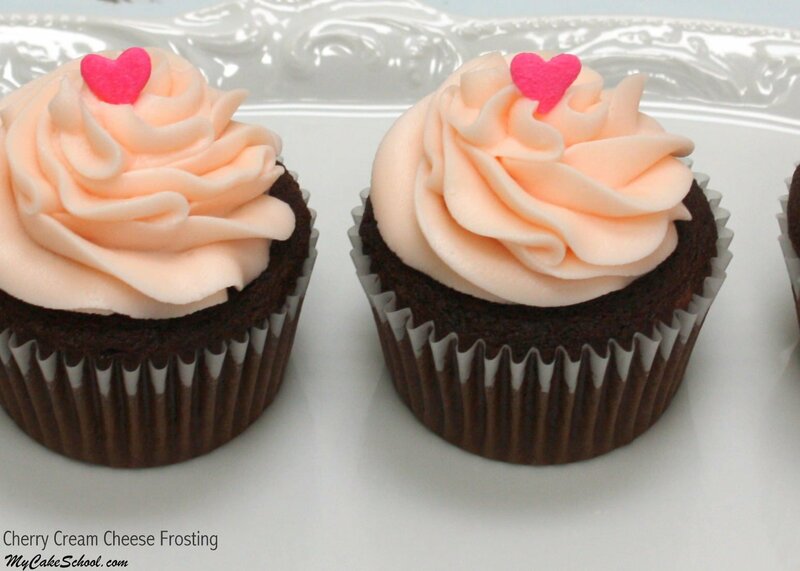 One cup of frosting will frost 12 cupcake with a simple swirl using a 2D tip. A high swirl will need double the amount. Remember to use full fat cream cheese and don’t over beat the frosting or it will become very soft. Have fun at the party !